November 17, 2010 January 5, 2018 P.O.P. Just finished reading “The Boy in the Striped Pajamas”, a children’s (?) book by Irish novelist John Boyne. It’s a poignant look at the Holocaust, particularly effective because events are viewed through the innocent eyes of Bruno, a 9-year-old boy. He’s the son of the (fictitious) commandant of Auschwitz who befriends a Polish boy on the other side of the barbed wire. It may be dramatic license, but Bruno is unaware of the horrors unfolding right under his nose; he doesn’t know what a Jew is, or even that the people in the “striped pajamas” on the other side of the fence are being held prisoner. In a way, Bruno’s naivete simply reflects the moral disconnect of the adults around him. The Nazis are not portrayed as monsters, but as normal people fiercely devoted to an ideology, people convinced that they are doing the right thing. Bruno’s father is a dedicated family man and a kindly soul who goes out of his way to help others in need – even as he oversees the extermination of an entire race. Ideology triumphs over reason and compassion, transforming human beings into us-versus-them creatures. In my time I have known many, many people who were immersed in some hateful ideology or other: they were racists, homophobes, jingoists, religious bigots, and of course liberal-bashers, among others. Generally, they were all of these things at the same time. But not one of them was really a bad person; in fact, most would have given you the shirts off their backs between their rages against THEM. An astounding number were devout Christians who could always pull up a Bible verse or two to prove that God structures the universe around their prejudices. So what would it take to transform these kindly acquaintances into assassins who bomb clinics or hijackers who drive planes into buildings while praising God the whole time? In some cases, probably just personal tragedy and/or the right kind of propaganda. But even without hatred, anger, grief, a campaign of persuasion, or even loyalty to an ideology, people are always quite capable of rationalizing their me-versus-them mindset. Many years ago while I was working for the library of a major city, it was my duty to deliver books and donated magazines to inmates. I became acquainted with and stood face to face with them (sometimes even without bars between us), some of the sleaziest characters ever to make headlines: cold-blooded killers, pedophiles, even an IRA terrorist awaiting extradition. All were congenial and likable if you could just forget what you’d read about them. The terrorist was especially soft-spoken. One of them had stabbed two college students to death in a petty altercation. A devout Christian, he turned down an offer of girlie magazines because he thought it was improper. Another was a hit man who admitted having killed 57 people. He chatted amiably about how he got into his “line of work” because his father had done it, and he’d retired with two cars and a boat so obviously it was a good life. He seemed upset at having been caught, and having “no parole eligibility whatsoever”. It didn’t occur to him that there was anything morally questionable about his profession. The world’s great atrocities are generally not committed by people who set out with the intent to do evil. On the contrary, they are committed by people who absolutely know they are right. I am 14 and live in South Africa. I was wondering if you could help me by telling me in what circumstances in the book do gretel and bruno see propaganda. 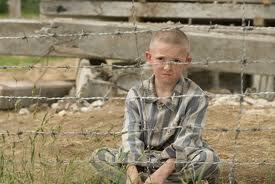 The boy in the striped pyjamas is my set work book and i need to write an essay on it. Thanks so much. Thank you for writing. I am sorry that I cannot be of much help, as it’s been a couple of years now since I’ve read the book and I don’t recall all the details. In any case, education is not just about getting the answers, but about exploring. I think you’ll find this book offers much to think about, and I am glad to see that students your age are being exposed to it. Some general concepts to look for in the book are: (1) The idea that the end justifies the means; (2) the concept of Nationalism, and the appeal to patriotism/ national pride to get people to go along with an agenda; (3) the desperate willingness to embrace anything that will lift a nation out of difficult circumstances such as economic downturn; (4) Scapegoating; (5) Dehumanization– the idea that the prisoners don’t really matter because they are less than human. If you can find specific examples in the book of some of these principles, I think you’ll have a good answer to your question as I understand it. Good luck! P.O.P. with the Holocaust or Shoah, why we hear so much about Germany and Japan so many years after WW2, is because Hitler, Tojo, Auschwitz, gas vans, experiments on prisoners, Nanking, Bataan, etc. happened by 2 advanced and cultured nations which have made Volkswagens, Porsches (that was after WW2), Mitsubishi, etc. Truth is that during WW2, both Germany and Japan believed they were the greatest. Germany and later Austria (after 1938 Anchluss) were advanced in many ways during the time of Nazis be it the fact that Germans were advanced when it came to automotive science, veterinary science, etc. The Einsatzgruppen who shot and killed Jewish men, Jewess women and Jewish kids in ditches did this because they believed they did the right thing and Nazis could be high intelligence such as the Nazi Drs. who used their intelligence for bad things. Hitler was a genius & he had charisma which could get millions to do what he wanted. Holocaust officialy began in Jnauary 1942 after the Wannsee Conference. But it’s believed it unofficially started in Fall 1941 during Operation Barbarossa. Nazi Germany originally wanted the Jews to emigrate to Palestine or an African nation but it later changed to exterminating Jewry. Nazis used codes such as expulsion, reservation, rather than extermination or gas vans and Hitler used euphemism of emigration after he knew the policy had changed to extermination. Nazis used euphemisms when they talked of exterminations. Finally, I drive a German car. When I bought by 2011 Volkswagen Jetta in May 2011, I asked the salesman if there are many Jews who would drive a German car. If you think I did right thing asking this then what do you think as most Jews wouldn’t drive a German car. The salesman got offended by saying that he doesn’t ask the religion of his cutomers.